Google will give you free stuff for becoming an active "Local Guide"
Search for a business or restaurant in Google Maps, and it will provide a helping of information, including store hours, address, and even photos. But did you ever notice that each business features a rating—and that you can directly contribute to the score? It's a little known fact, but Google Maps is basically like its own Yelp, providing all the relevant information needed before visiting a location. And in an effort to help promote this feature, Google is offering some great giveaways depending on how active you are on the mapping service. If, for example, you're a regular reviewer, you might be entered into a drawing to win a brand new Nexus device. You might even get invited to a Google summit in 2016, where you and other "top Guides" will discuss the life of a Google Maps contributor. 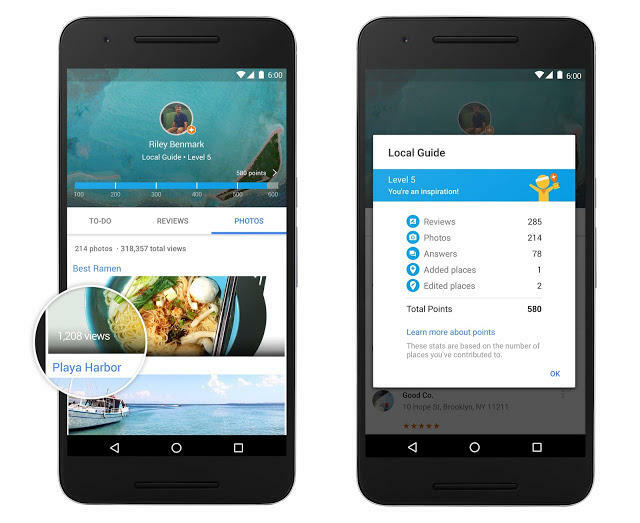 Google will base a user's eligibility on how much they contribute to the search giant's Yelp-like feature, breaking it down into five different levels. A Level 1 contributor will be entered into exclusive contests, while a Level 4 contributor will get 1 TB of Drive storage for free. Reach Level 5, and Google will schmooze you with a nice trip to its campus. In order to participate, you have to sign up to be what Google refers to as "Local Guides." Once you do that, you'll get points for adding new places to the map, writing reviews, and sharing photos. I don't want to brag or anything, but I'm at a whopping 1 point. The video above best illustrates what the Local Guides feature is like in Google Maps. Below are the types of rewards Google is offering to particularly active members. Level 1 (0 – 4 points): Enter exclusive contests (think new Google devices!) in select countries. Level 2 (5 – 49 points): Get early access to new Google products and features. Level 3 (50 – 199 points): Show up in the Google Maps app with your official Local Guides badge. Level 4 (200 – 499 points): Receive a free 1 TB upgrade of your Drive storage, allowing you to keep all the stories, photos, and videos from your travels in one safe place. Level 5 (500+ points): The very top Local Guides will become eligible to apply to attend our inaugural summit in 2016, where you'll be able to meet other top Guides from around the world, explore the Google campus, and get the latest info about Google Maps. Look out for details early next year.